A few months ago Google released Google Analytics 5 and set it to the default version for all Google Analytics accounts. Not only is the user interface sleeker and more bubbly, but this update included some amazing new tools as well. Tools like Visitor Flow, Webmaster Tools integration and Content Drilldown can give you a wealth of insight into visitor behavior - but we’ll be focusing on a couple of tools that provide data on goals and conversions, and what that data tells us about your overall Internet Presence. First, let’s talk about multi-channel funnels. For a long time, Google Analytics would only credit the last source of traffic for a conversion. So if someone came to your site through an online ad and then submitted a contact form, GA would give credit to that ad as the conversion source, even if they had visited your site previously from a different source. This is good to know but the data is incomplete and can easily lead to a misallocation of resources. Let’s use the online advertising example above. With this information, it would be easy to say, “Okay, let’s spend a ton of money on ads so we get more conversions.” But what if most of those ad conversions first discovered the company through Facebook? By focusing on the final traffic source, you’re only seeing part of the picture and are missing out on key aspects of the conversion funnel, like spreading brand awareness. Well, along came GA5 to save the day and with it, a ton of information about your conversion funnel and the path visitors take on their way to converting. Think about the last time you purchased something online. Did you go to a website, find what you wanted and immediately pay? Possibly, but what if the purchase you were making cost hundreds or thousands of dollars? You’d probably take a little time to research before making your decision. Large business decisions follow the same mindset. You might find a service you like, check out their website, check out their competitors, find them on Facebook, look from reviews on an outside source and finally, maybe days later, make your decision. Here are some of the common paths visitors follow before converting on our site. Quite a variety of sources, and check out #10! This person visited our site 14 times before converting! A big part of a strong Web Presence is the ability to build trust. Having a professional website is probably the most important part of your Internet Presence, but if you’re not well represented in social networks, search engines, business directories, review sites, etc., you stand a chance of losing the trust of your potential clients along the winding path to conversion. The Hare wakes up and says, “Today, I’m going to upgrade my server infrastructure,” while the Tortoise takes days or weeks to research before making a decision. You need a large and strong enough Internet Presence to hold the attention of the Tortoise while he meticulously reviews his options. Over a quarter of our conversions took over 12 days from first touch to final conversion. Without enough content across our Web Presence to keep these Tortoises busy, or without a consistent method for delivering email newsletters, they could have easily slipped away. The first touch and the last touch are very important, but equally important is every bit of content accessed in between. The truth is that your website alone won’t cut it anymore. The top of your conversion funnel, where potential clients discover your brand, needs to be as wide and varied as possible. Here’s a small segment of traffic coming to our Contact Page. Visitors come in through a huge variety of sources - Google, Direct Visitors, job postings and Facebook. The additional sources at the very bottom contain visits from our other social media accounts, listings on business directories, email campaigns, and more referral sources. It’s easy to focus on your website as THE source of conversion because it’s the last stop on the journey. But don’t lose the forest for the trees. Every aspect of your Internet Presence requires management, attention and focus. Every mention of your business online is an opportunity to pull in a new conversion. 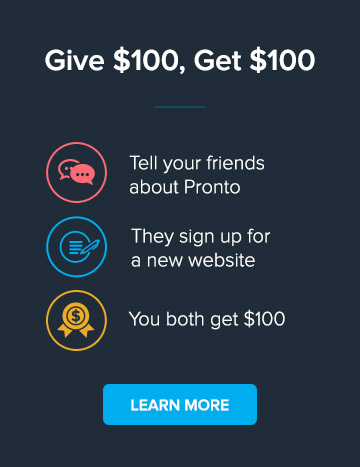 With Pronto, we’ve got your website under control, so get out there and make sure every part of your Online Presence is optimized to draw people in and push them through the funnel.